The development of the new Kvarken ferry’s optimal hull shape is underway. This so-called Hull Optimization Programme and the first open-water tests were described in our previous newsletter. 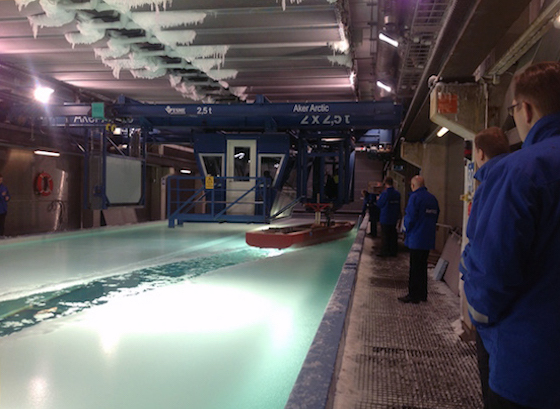 We have now performed similar tests in ice conditions at Aker Arctic’s laboratory in Helsinki. – The route between Vaasa and Umeå is almost always ice-covered during certain parts of winter. The ice conditions vary greatly from year to year due to e.g. the average temperature of the winter. In addition, the route’s local variations can be significant. Sudden changes in the weather can lead to several-meter-thick ice ridges in a very short time, according Mr Torvald Hvistendahl, the Naval Architect at SSPA. He showcases a figure illustrating the ice condition variations during the past 30 years. 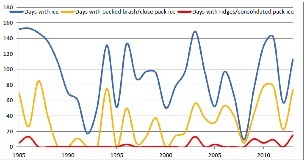 Figure: The ice condition variations during the past 30 years. – Reliability is one of the most highly valued characteristics of the new ferry designed to operate between Vaasa and Umeå. In other words, the new ferry is expected to have a high level of usability with only few traffic disruptions. However, an overly ambitious ice capacity can, at the same time, result in the ferry becoming less energy efficient in the open water. Therefore, this situation provides a good example of assessing and balancing two characteristics in order to reach an optimal solution, Hvistendahl continues. The testing of a model-scale ship’s performance in ice conditions is an extremely specialized area of operation − one where the Helsinki-based Aker Arctic company is the best in the world. The material characteristics of ice are far from linear, and the recreation of e.g. 50 centimeters of thick level ice in model-scale is a complex task. In a somewhat simplified way, the ice in laboratory conditions is similar to the consistency of “Frozen Margaritas”. It takes a long time to create the right consistency and, therefore, it is important to try to make good use of the ice by running several test series. For example, the first performance test is run through unbroken ice, followed by a test in the brash ice, which is then followed by maneuverings etc. In this way, the valuable ice is utilized to its full potential and the researchers gain results from different scenarios. The tests performed in June proceeded according to plan and provided promising results. The ferry passed all the tests, and the collected data is now ready to be put together. These results − together with the previous tests performed in open water − form an important basis for the continuing optimization and design work of the new ferry. We hope to return with more reports about the ferry’s development during this autumn.